The Freedom Model for Addictions – What is it? Did you know addiction IS NOT a disease? Did you know the brain disease theory is not based on sound science and is actually a myth? Did you know that addictions are habits, just like many other habits, and that as such are quite easy to break once you know the facts? Does your gut tell you that treatment is just another money grab from those who are vulnerable, and that something is drastically wrong with the rehab industry as a whole? If so, you’d be right – rehabs don’t work, and The Freedom Model tells you exactly why and how this Western cultural institution came to gain such power over people’s lives. For those immersed in the 12 step culture or in the rehab culture, this book provides a path out of those institutions, and into a much more empowered state of mind. Our experience of researching drug and alcohol use and helping thousands with these issues for more than 30 years tells us people desire to be completely free from addiction. They also want to be free from the idea of being “in recovery” just as much. Neither of these options: addiction or recovery – have held great favor with the masses. In fact, the vast majority of people with drug and alcohol problems (more than 90%) don’t go to treatment nor do they enter the subculture of “recovery.” They simply move past their addictions, and they do so without any treatment whatsoever. Did you know that? This is the great untold story in treatment circles, but one we unearth for your benefit. This fact alone demonstrates just how normal it is to break habits that we no longer want in our lives. Let’s face it, people desire freedom; freedom to choose their own direction; freedom to move past habits that have them feeling trapped and in pain; freedom from the addict and alcoholic identity; freedom from the limits of 12 step culture and the drug and alcohol rehabilitation industry; freedom to be happier; freedom to move on past the struggles and challenges of life. 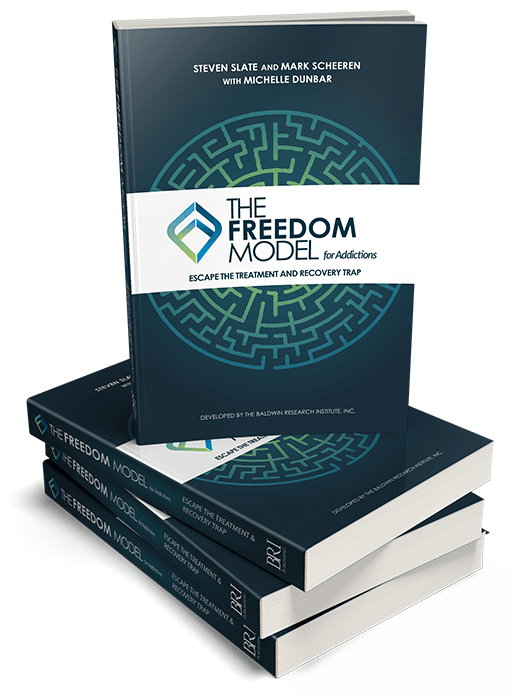 The Freedom Model guides the reader on this path by offering the opposite of the treatment industry’s empty promises – it offers real freedom! The Freedom Model is an approach that deconstructs the construct of addiction and recovery and all that surrounds these beliefs. By doing so, you can be completely free to move on in your life without those constructs holding you back and keeping you needlessly trapped in an endless addiction/recovery/addiction cycle. The Freedom Model renders addiction and recovery as completely obsolete and unnecessary in both your personal life and as cultural constructs that keep the masses blind to the solutions that exist within the individual. While The Freedom Model is a book, it is the research and the message contained on those pages that are the real solution to an individual’s struggles with drugs and alcohol. As researchers, Steven Slate, Mark Scheeren and Michelle Dunbar, have spent decades working together building this model. It came from many years of working and living with those we were helping find solutions to their complex struggles. We too struggled at one time ourselves, but we came to realize that the research provided answers that made personal change easy, efficient and enjoyable. If you are ready to change your life, and you want to be free from addiction, treatment and recovery – then The Freedom Model for Addictions is your answer.